Grinch's Green Pancakes (Courtesy IHOP). Ahhh, the season of cheer is near -- it's here! Get it? It seems only right to channel a little Dr. Seuss. I mean, IHOP is doing it (and doing it well). In honor of the latest adaptation of Dr. Seuss’ “The Grinch” being released Friday, the restaurant has partnered with Universal Pictures and Illumination Entertainment to launch a slew of Grinch-related menu items. It’s hard enough to choose what to eat at IHOP, but man, this is just making it even harder. 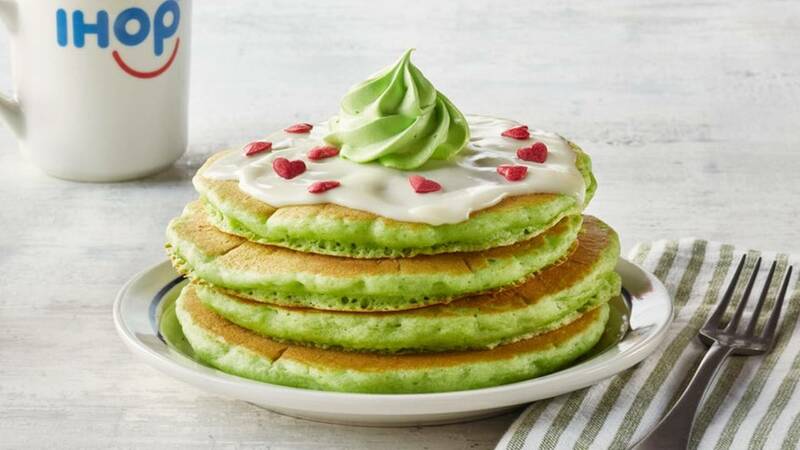 If you’re a pancake person, you’ll have to try the Grinch’s green pancakes. If you’re more of a protein lover, The Who-Roast Beast Omelette is calling your name. If there’s ever a season for a Minty Who-Hot Chocolate, this would be it. And, brace yourself, because who could turn down Whoville Holiday Cheesecake French Toast? Of course, there will also be Grinch-inspired kids items on the menu. And it's worth noting that kids under 12 eat for free (with the purchase of an adult entree) every day. "The holidays are such a special time for families and creating a delicious menu that reflects the fun and whimsy of Whoville in Dr. Seuss' beloved story about the Grinch is the perfect way for us at IHOP to celebrate the season," said Alisa Gmelich, IHOP's vice president of marketing. The Grinch-themed menu will be available through Dec. 31.